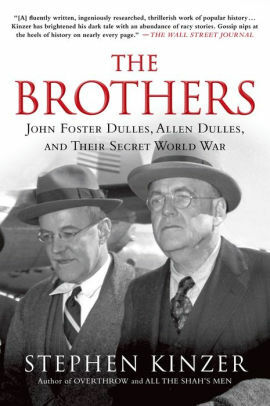 Stephen Kinzer, The Brothers: John Foster Dulles, Allen Dulles, and Their Secret World War (New York: St. Martin’s Griffin, 2013), 402 pages including notes, bibliography and index plus 8 plates of black and white photographs. Two of the most powerful men in America during the 1950s were brothers. John Foster Dulles served as Secretary of State under Dwight Eisenhower until Foster’s his death in 1959. His brother, Allen, was the CIA director through Eisenhower’s and the first half of Kennedy’s Presidency. The two had remarkably similar paths to power. Both were Princeton graduates. Both were Presbyterian. Both had spent their civilian careers working for Sullivan and Cromwell, a New York law firm that represented major American interest overseas. Together, seeing the world through a lens of good and evil (good being capitalism and evil communism), their influence was felt around the world and has effected world politics to the present. The two worked together to overthrow a democratically elected government in Guatemala and Iran. They forced out a popular African leader in the Congo, attempted to push out the elected president of Indonesia, and moved America into Vietnam as the French were withdrawing. After Foster’s death, Allen playing this role in foreign governments as the CIA attempted to overthrow Castro in Cuba, leading to the Bay of Pigs fiasco. In addition the brothers also had a talented sister, Eleanor, who played her own role in international affairs, especially in Europe. Kinzer does a commendable job as he draws sources from across the globe to create a portrait of the Brothers at work. The two brothers were raised within the Presbyterian manse. The father was a pastor, who would later become a professor at Auburn Theological Seminary. On their mother’s side of the family, they were descended from two former Secretaries of State. Ironically, their beloved “Grandfather Foster” had been the American Secretary of State who helped overthrow another government, the Hawaiian monarchy. This allowed the American annexation of the islands. Of the two brothers, Foster settled down quickly (marrying a woman his younger brother had rejected). He lived his life devoted to her. Allen, on the other hand, was always having affairs (his wife even became friends with two of his mistresses) and his many liaisons probably ncluded the Queen of Greece. Both brothers began their international interest in the aftermath of the Great War (World War I). In the 1930s, Foster was supportive of Germany (Sullivan and Cromwell had many German clients as well as representing American business with German interests). This led to the one time the two brothers had an open disagreement with Allen asking Foster how he could consider himself a Christian and support what the Germans were doing to the Jews. But soon, this became a moot issue as America was drawn into the war. During the war, Allen, who was always interested in covert work, headed the American spy network in Switzerland. After the war, when the OSS was disbanded, Allen was without a job. In less than a year later, the CIA was organized and he was brought on as second in charge. In the early 50s, he became its director. At the same time, his brother served as the Secretary of State. The idea of two brothers in such key roles, not to mention their legal ties to many leading international businesses, is easily seen today as clearly a conflict of interest. However, such a breach of protocol wasn’t much of an issue in the 1950s when the country felt it was in a battle between good and evil. Whatever it took to win was seen as necessary. While the Soviet Union certainly presented challenges to the Western World, new research indicates the challenge wasn’t nearly as great as it was thought to have been. Kinzer points out the blunders of both sides in Africa, where neither side understood the continent. The Soviets even sent snowplows to a country that had never experienced snow and wheat to the Congo, a country without a flour mill. Kinzer’s view is that the Brothers (and in some way, all of America) were so colored by the Cold War that they were unable to see beyond their own assumptions and thereby missed opportunities to build a more peaceful world. As divided as the Brother’s saw the world, Kinzer points out how they clearly avoided direct conflict within the Soviet and Chinese spheres. When the Romanians revolted in 1956, they watched as Soviet tanks moved in to crush the rebellion. While there was espionage behind the “Iron Curtain,” such as U-2 flights over Russia, the real battle was waged in smaller counties, many of whom attempted to remain neutral during the Cold War. The Brothers didn’t believe neutrality was possible. The strength of Kinzer’s thesis is in his research and in his accessible writing style. However, there are weaknesses within his logic and the application of his research. Several times he refers to Foster and Allen’s “missionary Calvinistic background.” Granted, Kinzer isn’t a theologian (he even confuses Princeton Seminary with Princeton University). But a bigger problem is his use of “missionary Calvinism” in a negative (almost ad hominem) manner. First of all, I am not sure what he means by this description (nor am I sure what that he knows what he means). While many Calvinists have been missionaries, some would point out that Calvinism hasn’t displayed the missionary zeal of other theologies. But more importantly, Calvinism, with its view of human depravity, may be more applicable to the situation with the Dulles brothers. The emphasis on depravity is a belief there is a stain on the soul, in the heart of all people, that’s so deep that only God can remove. Such a doctrine stands in opposition to the dual world view of good and evil. Calvinists understand that we (the human race) have fallen. There are not those who are good and those who are bad. The only one good is Jesus, the rest of us are only righteous by his actions. Because of this strong view of how we, as people, seek out own on interest instead of what God desires, Calvinists encouraged from the beginning a system of checks and balances to keep individuals from claiming too much power. Certainly, the Dulles brothers lacked a desire to have such constraints of their power. If anything, it wasn’t Calvinism that cause their blinders that kept them from seeing a more nuanced world. It was either their ignorance of Calvinistic theology or their ignoring of the teachings of their church. The complexity of the human spirit and its complicity in sin can be seen clearly in Allen. He could be noble as in challenging his brother’s support of Germany in the late 1930s while practicing serial adultery and later, approving of covert campaigns in countries striving to be neutral during the Cold War. The author also places Reinhold Niebuhr, one of America’s leading theologian during the 50s, in conflict with the Brothers. In his concluding chapter, he quotes Reinhold Niebuhr’s critique of the Brothers’ “self-righteousness” and lack of nuance in understanding right and wrong. However, I am not sure the conflict was as divided as Kinzer makes it out to be. Niebuhr is a complex man who wrote prolifically. While Niebuhr understood sin and the dangers of pride, from my understanding, he also supported America in opposition to the Soviet Union throughout the 50s. So while Niebuhr critiqued their self-assured swagger and unchecked power, he may have been supportive of their long-term goals. Despite the author’s lack of understanding theological nuances, I still recommend this book. It shows the impact American business had on foreign policy. Was the overthrow of the Guatemalan government necessary in the fight of communism or was it convenient ploy that allowed the brothers to help a former client, United Fruit? The danger of ignoring such obvious conflicts of interest is revealed throughout this book. The book demonstrates just how powerful these two men, who are mostly forgotten today, were in the 1950s. They were even able to “force” Hollywood to change movies (George Orwell’s Animal Farm and Graham Greene’s The Quiet American). In both movies, the script departed from the book in a manner that made the story fit the Cold War mentality of the 1950s. Both authors were incensed at Hollywood’s interpretation of their books. This book provides a portrait of the man for whom Washington’s International Airport is named. Having read this, I would like to read more about Foster’s children. His son, Avery, converted to the Catholic Church and became a Jesuit priest. He would go on to become an American Cardinal. His sister, Lillias, attended seminary and was one of the first women to be ordained in the Presbyterian Church in 1957. He had one other son who was a mining engineer. The family dynamics must have been fascinating. . This book speaks to our current age and our tendency to demonize our opponents. There are always dangers of seeing the world clearly divided into good and evil, especially when we see ourselves on the side of good and our enemies as always evil. While the Christian faith teaches of a cosmic battle between good and evil (God and Satan), that battle is also taking place within each of our souls, which blurs the battle lines. Furthermore, the victory within the cosmic struggle has already been won at the cross. We pervert Jesus’ teachings when we see ourselves as only good and others as only evil. The human race is much more complicated that this simplistic understanding that leads to a division between “us” and “them.” When we quickly demonize others, we risk denying the image of God instilled in us all. Fascinating. Never knew anything about these guys. Re “Calvinism,” it’s been my experience that there are folks who are rather loose with that term, both in good and bad ways. I can see how you, as a Presbyterian pastor, found the author’s references off-putting. Thanks for another good recommendation. I knew of John Foster Dulles (and “his” airport), but not his brother. They sound like quite a pair. In fact, the whole family sounds fascinating. This sounds like a thought-provoking account of the complex lives of these two brothers and their influences on history, politics, and culture. Thanks for the review. This sounds interesting! I’ve never heard of these guys. One of my goals for next year is to read more books about American history and politics. I want to know how the country became what it is today. Great review! same time as you amend your website, how can i subscribe for a blog site?